Thailand's cluster of islands offers visitors myriad experiences that complement the picture-postcard locale. From sun worshippers to sea sport lovers and those seeking pure rest and relaxation, the islands offer something for everyone. At the southern part of the Andaman Sea lies a great spot for those seeking to get away from it all - Koh Hai Fantasy Resort & Spa, located on Ngai (Hai) Island, within the Trang Archipelago. This resort is located approximately 12km off the coast of Trang. After a long and tiring eight-hour bus ride from Kuala Lumpur, followed by a half-hour boat ride from the Pak Meng Pier, the island was balm for the soul with its fresh clean air, lush tropical rainforest surroundings and crystal-clear blue sea. The resort covers 8.8ha of land with a tropical garden, lush mountain backdrop, swimming pool, a spa and 85 suites and bungalows of contemporary Balinese design located on the beach and hilltop. New resort, the Chateau Hill Resort, which is a five-minute boat ride from Koh Hai Fantasy Resort & Spa. The four-star resort, which resembles a castle, has 36 suites and rooms incorporating elements of Cambodian designs in their interior. You can choose to stay on the island, or venture out to explore the surrounding islands such as Emerald Cave, Koh Cheuk, Koh Ma, Oh Rok and Koh Kradan, among others. If you are keen on scuba-diving, the best period for this activity here is in November. Trang is known for its many popular dive spots and the coral reefs are simply amazing to behold. Other activities for the sport lovers include snorkelling, canoeing, island trekking or some sepak takraw on the beach. After an exhausting day, head over to relax and rejuvenate your mind, body and soul at Raya Spa. Opt for the various treatments available. Get a facial or massage to loosen those tensed muscles. The professional masseurs will knead away all those aches and pains. In the mornings or evenings, sit by the Pool Bar restaurant after a swim, to have a drink or a quick bite. Alternatively, you could also unwind with a drink at the Blue Lagoon Bar while watching television or reading a book borrowed from the book corner. As for the Rayabura restaurant, it offers a wide spread of international, Thai and fresh seafood cuisine. Guests can enjoy a candlelight dinner under the stars or sit indoors at the newly-refurbished dining area, decorated with wood carvings and Balinese furniture. In the late afternoon of Sept 27 last year, a Malaysian friend called to ask if I could file a story on Myanmar’s latest situation. That very day, Japanese journalist Kenji Nagai had been among those killed by the military suppressing a pro-democracy demonstration in Yangon. At the time, my wife and I were about to cross the Sino-Myanmar border in Kokang in Myanmar. The crossing was not timed with the Yangon mayhem, though we were aware of the vehement protests being led by the Buddhist clerics. We were just paying our regular visit to Kokang to inspect the school we had set up and to attend to the spiritual needs of believers. We felt greatly relieved therefore to find no unusual movement of troops on either side of the border, an indication that the Myanmar unrest hadn’t spread to its countryside, at least not in Kokang. It was business as usual in Kokang especially for its ubiquitous casinos and other entertainment centres. The only inconvenience was that it had become difficult for the locals to travel to Lashio and move on to Mandalay and Yangon, the two cities in turmoil. Keen to learn: The writer and wife with the young children of their school, Sheepfold. A team of EU representatives scheduled to visit Kokang had to be flown in by helicopter from Lashio. Kokang’s head of government Chairman Peng Jiasheng, immobilised more than a month by back pain, had deputised his brother to receive the foreign guests. We were naturally more concerned with visiting the Chairman, something we always did whenever we landed in Kokang. To ensure that the Chairman was well enough to see us, my wife Esther called his mobile. The line was immediately connected, blaring out Peng’s favourite song from the movie Shanghai Beach. There seemed a certain affinity between the “Kokang king” and the Shanghai mafia. The 76-year-old man we counselled three days later appeared even more humble, perhaps humbled by sickness. Peng was born in 1931 and as a teenager he joined the militia of the Yang family, which ruled over Kokang. In 1949, Peng received military training together with fellow students like Luo Xinghan under retreating Kuomintang officers. From 1959 to 1968, Kokang came under political upheavals. The Myanmar government drove the Yangs out of power with Luo backing Yangon and Peng fighting it as a guerrilla leader. By 1969, Peng recovered Kokang under the banner of a China-backed Burma Communist Party. Opium production jumped to bankroll armed insurgency. In 1989, Luo succeeded in getting Peng to stage a coup against the Communist leadership and Kokang was granted autonomy. Yangon appointed Peng chairman of Kokang and allowed him to keep his armed troops (MNDA Army) and run his court of law. Some years later, Peng survived a mutiny and subsequently cleansed Kokang of opium by the end of 2002. In the name of economic survival, Peng allows gambling and the flesh trade to flourish in this frontier town bordering China’s Yunnan province. And so Kokang continues to attract complex people to its doorstep. In Kokang, not many will tell you their real names, let alone their purpose for being there. There are habitual gamblers, drug and arms dealers, seekers of carnal pleasure, undesirable elements on the lam, corrupt officials, poor people making an honest living, and spies. Chairman Peng in a good mood. Kokang, because of its geography and history, remains a place where information related to narcotics and other crimes is actively sought. China has undoubtedly planted its people in the Kokang government to safeguard its backdoor. Likewise, Yangon has its informants roaming the Kokang streets. For years, mutual distrust has developed between Peng and the military junta of Myanmar. The initial appearance of Esther and I there must have aroused suspicion, mistrust or plain bewilderment in many minds. Our repeated returns to Kokang, however, won us the friendship and favour of the Chairman. Peng allowed us to start a humble school offering free education to the children of former poppy farmers. Until Kokang’s crop substitution programme succeeds like that of northern Thailand, the Kokang farmers will remain poor. Some have virtually been subsisting on rations handed out by the United Nations and other NGOs. Our privately-funded school, called Sheepfold, takes in their children as well as orphans and those from single-parent families. Many children in Kokang have been left behind by parents who have either been summarily executed or are serving long sentences in China for trafficking drugs. Sheepfold provides normal education in Chinese and Myanmar for children aged six to 13. We employ local teachers and have a small committee to help oversee the school. Presently, we have some 40 pupils housed in one room but are taught separately under three levels, a practice common in rural China. Peng gives us a free hand to run the school and helped us solve a sticky problem in March last year. He extends favour to us in other ways too. We have a certain amount of freedom, for example, to move around in Kokang including security areas manned by the MNDA Army. We love to mingle with Peng’s soldiers, many of whom started their career as kids. It’s not uncommon to see a very young soldier in oversized uniform and an equally oversized rifle slung over his shoulder. Zhou Zhengrong, for example, joined the Kokang army at 13. When we first met him in 2005, Zhengrong was 17 and appeared undersized and sickly. He was one of the eight children of a poppy farmer. Since poppy cultivation had been banned, Zhengrong dropped out of school with just a year of formal education. Later, he followed in the footsteps of his siblings and became a MNDA soldier. We met him recently and were glad that he had become healthier and looked tougher. Military training has done some good for Kokang boys who have neither a decent education nor job opportunities. Another example is Shen Caogui, a lanky bodyguard of Chairman Peng. Like many other MNDA soldiers, Caogui has difficulty writing his own name. However, he has a chance to make good as a soldier and was picked to provide round-the-clock protection to the Chairman. He once watched his boss praying with us and later wanted similar blessings for himself. Girls have better chances of employment in Kokang. Young girls with secondary school education usually go for higher paying jobs in casinos, though they are required to work long hours in a not-so healthy environment. Since May, the MNDA Army has recruited its first batch of 90 female soldiers. All in, there are some 2,000 soldiers on the army roll. AFTER seven wonderful years in Taipei, it was not easy to just pack up and leave, which I decided to do several months ago.I was eager to see for myself the reality behind the hype about China being the rising new economic superpower whose GDP (gross domestic product) has been surging past those of many traditional powerhouses.My motivation was partly the pull factor – the promise of new prosperity – but there was also a bit of the push since Taiwan’s importance has been overshadowed by China in recent years. However, I was lured by the exciting prospect of a fresh start in Shanghai – the most westernised and cosmopolitan city in China. There was a bit of nervousness from the prolonged cross-straits tension that has put the island in a volatile and vulnerable position. At the same time, my job as a journalist in Taipei did not seem to offer much prospect, with no salary increment in sight after two years. The time was right, I convinced myself, to embark on a new adventure. So, last October saw me packing up my stuff in Taipei and setting off for Shanghai. During the first two weeks, I shifted accommodation three times. First, I stayed in a budget hotel, then bunked at a friend’s home and, finally, I found an apartment in the upscale Jinganshi district that was shared with a bunch of French expatriates. It was only after I moved into the apartment that I realised how international Shanghai had become. The rapid development in recent years has attracted not only a massive influx of capital from abroad but also hordes of foreign talent. 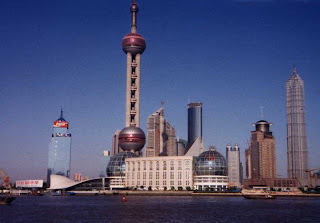 According to Business Week, over 150 multinationals had set up offices in Shanghai in 2006 alone. The city reported 12% economic growth the same year, even higher than the blistering national average of 10.7%. “I am worried about the future competitiveness of Taiwan,” lamented a Taiwanese friend after her trip to Shanghai. Don’t get us wrong, we are still deeply in love with Taipei, and we have so many fond memories of the city. Taiwanese are open-minded, they have press freedom and passionate about politics; this is a huge contrast to mainlanders. From my years staying in Singapore, Kuala Lumpur and Taipei, I felt most at ease among my Taiwanese friends. But I chose to look for something new and, thus, began my flirtation with Shanghai. Shortly after landing in Shanghai, I became acquainted with a bewildering variety of foreigners from as far away as France, Russia, Spain and even Malaysia, all seeking their fortunes in this city of opportunity. Almost immediately, I sensed it was not going to be easy. Shanghai, being the wealthiest city in China, is a magnet for millions of immigrants from smaller mainland cities and rural villages, all trying to make it big. The number of fresh graduates fighting for a job market is scary. A friend who hails from Guizhou tells me that fresh graduates are happy to secure a job offering 2000 yuan (RM900) a month. With so many expatriates, myself included, trying our luck in China, it remains a big question mark if local companies would be willing to hire me, let alone pay according to my high expectations. The last time I checked a recruitment website, there were over 200 people vying for the same vacancy! Just when I was beginning to wonder if I was losing my edge in the job market, something unexpected happened. I discovered that one of the fellow students at my ballroom dance classes in Shanghai is from my hometown, Malacca! And, the 30-something lady is in charge of operations at “Three on the Bund”. Touted as one of the best places to see in the new China by Time magazine in 2005, Three on the Bund is a renovated 1916 building strategically located along the renowned Shanghai bund. It houses four of the city’s top eateries, an art gallery and a spa that boasts of rivers flowing with Evian, as well as an Armani flagship store. She extended a warm welcome and even offered me a job in her glamorous firm. Who could have expected to meet someone from the same hometown, and even get a job offer, while taking dance lessons in a strange land? This, to me, is the charm of the new China – anything is possible, anything can happen. It never ceases to amaze me how much and how quickly it has evolved. Still, I decided to say goodbye to Shanghai, despite the promise of great possibilities. My three-month sojourn there made me realise that, after all these years, I have become used to the warm and friendly Taiwanese and I missed them so much when away. But, should wanderlust strike me again, I’m thinking ... Beijing. Western and local tradition are seamlessly juxtaposed in Qingdao, famous for its beer and host of the 2008 Beijing Olympic sailing events. IF YOU stood at the top of Xiaoyushan (Little Fish Hill) in Qingdao and looked down over the city, you could be forgiven for thinking you were in Europe, or to be exact, Bavaria. Except of course, for the crescent-shaped bay with a golden sand beach more reminiscent of Hawaii’s Waikiki. Whereas many places in Asia are eager to rid themselves of their colonial past, Qingdao has chosen to preserve its quaint European buildings as a tourist attraction. Constructed when the outpost was a German possession in the first two decades of the 20th century, they give the city a distinctly western feel. Qingdao (population 7 million) is not only Shandong province’s premier port and home to respected companies like Haier and Hisense, but it has also been chosen to host the sailing events of the Beijing Olympics later this year. The metropolis’ history and economic success have created affluent and sophisticated urbanites who have evidently absorbed lots of outside influences. But sometimes, local and western traditions are intermingled in the weirdest of ways. One brisk late autumn morning, my friends and I were waiting for our coach in the warmth of a hotel lobby when the sounds of a marching band wafted in from the outside. We rushed to investigate and there, in the hotel driveway, life-sized versions of cartoon characters Mickey, Minnie, the honey-loving bear, Winnie, and a pink piglet were dancing to a tune played by a small marching band smartly decked out in red jackets and white pants. That in itself was plenty bizarre but soon a white, impossibly long stretch limo pulled into the driveway. Jaws dropped. I counted six windows on each side. Our cartoon friends joyfully approached the car, making deep bows as a young couple emerged – she in a demure white wedding gown and he in a dark suit – then held hands and danced in a circle around the bride and groom. At the entrance to the reception area the dignified couple posed for photos with the two mice, the bear and the piglet under a red balloon archway topped with the time-honoured wedding symbols of a dragon and phoenix. It was the middle of the ninth lunar month (late October), a particularly auspicious time for weddings, and over at the old colonial enclave of Badaguan, flower-decked cars lined the roadsides. Badaguan, with its grassy parks, tree-lined avenues and a mishmash of different styles of European architecture is an obvious choice for wedding photos. On that very cold day, brides in thin white dresses preened and posed against the stone-walled houses while assistants handed out lucky candy to well-wishers. A bride hurrying towards her family lifted her long skirt to avoid tripping. A flash of red appeared. Beneath that white satin skirt she was wearing bright red tights and equally red shoes. Red, the traditional wedding colour, is auspicious while fashionable white is the customary colour of mourning, so the red stockings and shoes were insurance against bad luck. The brief German occupation in Qingdao produced a world-famous beer whose name is synonymous with the city. Located at the site of the original factory, the newly-opened Tsingtao Beer Museum leads visitors through the production process, a history section, an exhibition hall, and finally, an eagerly-awaited tasting room set up like a pub, except with free beer. The Museum has spared no effort in creating an educational experience but it certainly is not without a sense of humour. For just before the entrance to the Beer Hall we encountered a windowless box-like pinewood structure named, tongue-in-cheek, “Tipsy Room”. Once inside, I found myself lurching all over its angled floor, desperately clinging to the railing on the side as I crawled towards the exit. That simulated state of inebriation was meant to remind those entering the next section – the Beer Hall – to be moderate. But judging by a group of shrill, excited ethnic Dai girls who broke into their melodious drinking songs with each toast, it is anybody’s guess whether the Tipsy Room made a difference. It seems the crisp, clean taste of Tsingtao Beer comes from the pure waters of Laoshan, a hilly resort area less than an hour’s drive from the city centre. Laoshan also happens to be one of the oldest and holiest Daoist sanctuaries in China. Some believe Daoism’s founder Laozi came from there. The road to Laoshan offers breathtaking views of the Yellow Sea. In contrast with modern urban Qingdao, innumerable ancient temples dot the mountain’s wooded slopes, maintained by Daoist priests in flowing blue robes. An ascetic-looking “immortal” with black beard and topknot sat outside the door of a small vermilion building. Dressed in grey Chinese jacket, cotton pants and cloth shoes, he looked as if he could have stepped right out of the Ming dynasty. Then he whipped out his mobile phone, and at that surreal moment 21st century technology converged with 26 centuries of Chinese tradition.